Those leaves look a bit like my Euphorbia mellifera leaves. 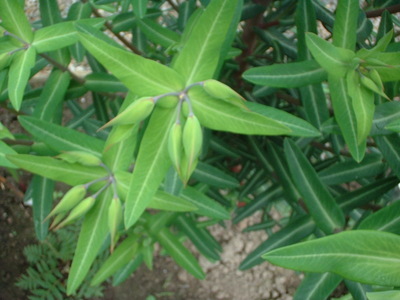 Or it might be Euphorbia Cornigera. The sap in euphorbias can cause a nasty reaction in many people and I always wear gloves when handling them. Looks like Euphorbia Lathyris to me, caper spurge or mole plant.